Senior Naval Officer Western Australia, Commodore Brett Dowsing, RANR, speaks at a media conference on the arrival of Indian naval ship Shivalik into the Port of Fremantle as a part of Exercise AUSINDEX 2017. For years, Australia has been quietly strengthening defense ties with India and other Indian Ocean partners. The announcement of Indo-Pacific Endeavor 19, a naval deployment launched in March by the Australian navy and involving exercises and cooperation with seven nations — Sri Lanka, India, Malaysia, Thailand, Vietnam, Indonesia, and Singapore — is a seminal development that needs to be seen in the context of Australia’s role in the Indian Ocean region. As a prominent regional maritime power, Australia has for some time nursed ambitions to play a larger security role in the Indian Ocean region, evidenced by a parsing of its 2013 National Security Strategy and Defense White Paper. Even though the Australian Defense Force has made important contributions to regional security, notably in Afghanistan and the anti-piracy patrols in the Gulf of Aden, as a subordinate alliance partner of the United States, Australia’s efforts have largely gone unnoticed. Evidently, Australia aspires to play a more independent and central role in the region, alongside India, an established regional power with significant strategic autonomy and influence in the region. Over the past decade, Australia has proactively pursued its political and strategic relations with India as a matter of national priority. This is evidenced by the fact that all four Australian prime ministers between 2006 to 2014 visited New Delhi. In 2009, during Kevin Rudd’s visit, bilateral ties were upgraded to a strategic partnership and a series of agreements for cooperation in defense and security matters were signed. Yet there were no reciprocal visits from India until 2014. Evidently, bilateral ties during this period were marred by a spate of racial attacks on Indian students in Australia, which were later properly tackled by the Australian authorities. However, bilateral relations have since improved and Indian Prime Minister Narendra Modi made a state visit to Australia in September 2014, becoming the first Indian prime minister to visit Canberra in 28 years. The highlights of the visit were a landmark agreement for civil nuclear energy cooperation and the signing of a joint declaration on security cooperation, providing a framework for cooperation in the fields of defense and maritime security and an action plan for an annual meeting by the two prime ministers and regular interactions between foreign and defense ministers. Australia is only the third country after the United States and Japan with which India has signed a similar framework agreement. 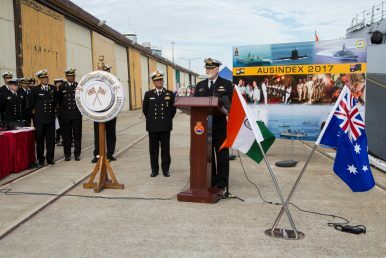 Since then, India-Australia defense cooperation has expanded to include an annual Track 1.5 defense strategic dialogue, service-to-service engagements, multinational combined exercises and AUSINDEX, an annual bilateral naval exercise. The first iteration of AUSINDEX was conducted in the Bay of Bengal in September 2015. In 2017, the Indian Air Force participated in a combined air combat exercise, Pitch Black, a biennial exercise hosted by Australia, that includes the United States, Canada, France, Germany, Indonesia, the Netherlands, New Zealand, Singapore, and Thailand. Additionally, both sides agreed in the 2014 security cooperation framework to explore defense research and development cooperation and promote joint industry links. Despite wide ranging and high-level bilateral defense engagements, Indo-Australia strategic relations seem to have plateaued. India has declined requests by Australia for inclusion in the multinational combined naval exercise, Malabar, currently held by India with the United States and Japan. A quadrilateral naval exercise would send a clear political signal to China – something that India, currently, seems unprepared to do, given Australia’s traditional positioning as a “detached” regional state. For now, this limits the extant level of strategic ties, much to Australia’s chagrin. However, Australia, having long served as an alliance partner of the United States, and having worked patiently with India to seek a larger role in regional security, seems determined to expand its own maritime security cooperation with other states in the Indian Ocean region. The latest announcement of a seven-nation naval tour with accompanying exercises by the Australian navy, involving Sri Lanka in India’s neighborhood along with Southeast Asian navies, is evidently a step in that direction. Reportedly, Australia will deploy about 1,000 security personnel on four naval ships and a military aircraft for the naval exercises. The drills will be held bilaterally with each of the seven navies and appears similar in format to the annual Cooperation Afloat Readiness and Training (CARAT) multinational exercise conducted by the U.S. Navy with various Southeast Asian navies. Clearly, a large-scale annual combined naval exercise by the Australian navy, including various countries in the region, would help Australia improve its profile as regional maritime power and carve out a larger role for itself in the Indian Ocean. While Australia has been closely associated with various Southeast Asian states, a new partnership with Sri Lanka could pave the way for further for engagements with the Maldives and beyond. What does this mean for India? India is unlikely to be perturbed by growing Australian maritime power, even if it impinges on its core sphere of influence in South Asia. In fact, rising Australian influence in India’s neighborhood could be used to advantage to counter Chinese influence in the region. However, Australia would be well advised to be mindful of India’s concerns, which will include treading carefully on relations with Pakistan.